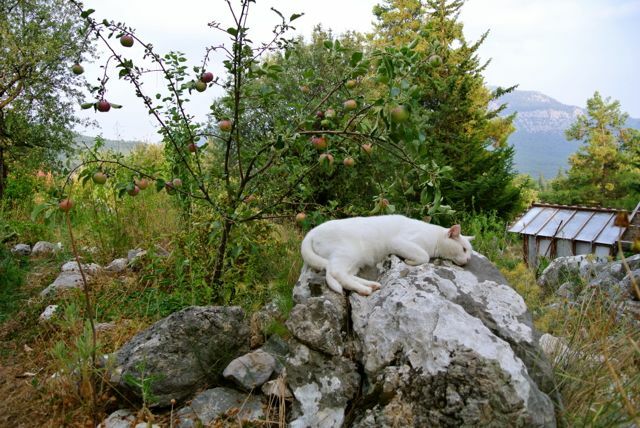 Damla enjoys a cool evening, feline style — on a nice hot rock. The week started off full of promise and ticked merrily along. We went marketing on Monday and I found some nice green Summer apples (or at least that’s what they’re called here). On Tuesday I juiced them with the steam juicer, thinking I would make them into jelly the following day, but I had forgotten that Kaya had a doctor’s appointment on Wednesday, so the apple juice sat around in cola bottles until Thursday while we made a trip into Antalya. When I opened them on Friday, I found that things had gotten pretty lively and the apple juice was more a bubbly cider. Never mind. I made it into jelly anyway. I use apple jelly to thicken jam made with fruits not high in pectin, like sour cherries, or to make rose jam. I used up the last of my stock of apple jelly making sour cherry jam a few weeks back, so it was high time I replaced it. It’s simple to make — you just take equal weights of juice and sugar, add the juice of one lemon, and bring it up to 104.5 degrees Centigrade, the setting point for jams. Then you can bottle it in clean jars and you are ready when a basket of rose petals, pears, or cherries comes your way. The juice made perfectly good jelly, so if there is anyone out there with fermented juice on their hands, fear not — it sets just fine. I was feeling quite pleased with myself for this and other industrious tasks, and then came yesterday. I am not sure what it was, because we have certainly had hotter days (I think the temperatures really only got up to 37 C/98 F), but I was completely steamrollered by the heat. It just seemed to go right through me. Usually, I don’t mind cooking in the heat of the day because it’s hot anyway, and I have to get dinner ready in the afternoon because I work in the garden after 6, but even the most rudimentary kitchen work was beyond me. Laundry hung on the line, forgotten. I put Kaya down for a nap and fell fast asleep myself. I woke up disoriented and stupified. Finally the heat lifted, as it always does, when the sun slid behind the hills at 6 and gradually I began to fill a bit more alive. My mother and I had prepared a turkey pot pie for dinner (I somehow managed to make and roll a pie crust, which on this day was a major achievement). Guilty for having achieved nothing in the garden, I made apple dumplings for dessert. The boys were also feeling sparkier in the evening, and they got interested in a hole Ali was digging to plant a palm tree. It turns out that Kaya finds the hole digging process fascinating, and Baki was quick to spot a wriggling worm. Yes, I feel the same way about pectin. It feels a bit like making Jell-O whenever I use it. And I won’t lie — I enjoy your photos so, it’s a thrill that you like that shot. She works with what’s at hand! The heat can really sap your energy but you certainly accomplished a lot. Sometimes I guess it’s best to focus on what has been accomplished rather than what hasn’t! I think it makes us happier that way. Haha! Funnily enough, she didn’t. But two summers ago I was pregnant with Kaya and I didn’t get a lick of work done! And isn’t it great how endlessly photogenic kids and animals are? Your body was telling you to slow down a bit and get some rest. Love your apple jelly idea. Now your cat has the right idea. The execution could be improved, like how about seeking out some shade, but the idea is a sound one. Lay down in the heat! 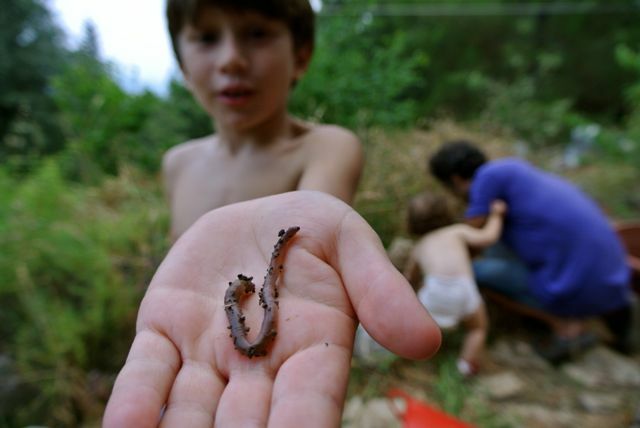 I don’t know what it is about worms but I sure did pick up my fair share when I was a boy. Damla always has been the cleverest of us all. I can tell she knows it, too, by the way she looks at us.